An Abscess is a collection of pus (necrosis) accumulated within tissues as a defensive reaction to bacteria or foreign matter. 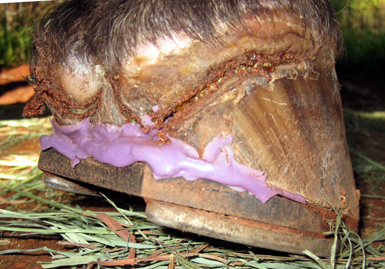 Abscesses originate in the laminae, therefore fall under the pathogenesis of Laminitis and are either a sign of deterioration or remodeling of the hoof. Laminitis is caused by dietary (over-feeding), pharmacutical (immunizations, cortisteroids, wormers) or mechanical (wrong shape, shoes, concussion) stresses. The abscessing episode can be anywhere from severe to minimal. Every horizontal ring on the hoof wall represents a former insult to the laminitic connection. Symptoms: Horse suddenly becomes lame - lying down - “pointing” one or more feet - heat in hoof - elevated heart-rate - bounding digital pulse - swelling above the coronary band (often up the leg) - rocking onto back legs - refusing to move - sweaty - temperature - stands “parked out”. The Course Of An Abscess begins with a pre-existing systemic imbalance 1) Insult or “trigger episode” occurs 2) MMP enzymes in the cecum release erratically causing breakdown in basement membranes that form laminae 3) Sensitive and insensitive laminae lose their connection leaving necrotic tissues which fester and become pus 4) Infection errupts and blood vessels dialate with nowhere to expand within the hoof causing intense pain 5) Abscess eventually errupts through either the coronary band including heels, the frog or through the sole, “sub-solar”. After the initial insult, it can take up to three weeks before lameness symptoms appear and from that point it can take hours or weeks for an abscess to run its course and only then will the horse feel relief. -- Allow the abscess to run its course naturally! 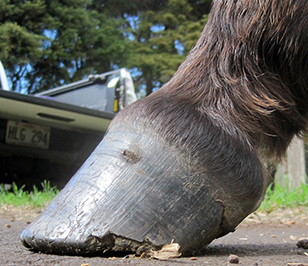 Do not use hoof-testers to determine the site (they do more damage) and avoid cutting or drilling into the hoof to prematurely relieve pressure. 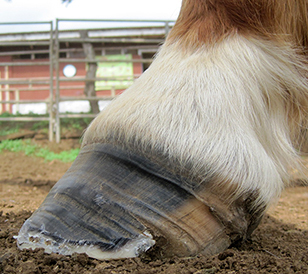 Maintain the Perfect Shape of the hoof to prevent further damage and generate healthy new growth using hoof casts when necessary. 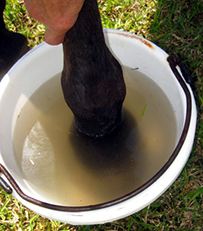 -- Cryotherapy At the first sign of lameness and throughout the whole episode, the hoof should be submerged in ice water twice a day until it chills to the core = 10 - 15 minutes. You can add a vinegar/baking soda combination, salts or your favorite thrush remedies to the ice water. Definitive studies have proven that cryotherapy prevents the laminae from separating while warm water allows it to release easily! Ice water reduces pain, stimulates the growth of new nerve cells and regenerates circulation. 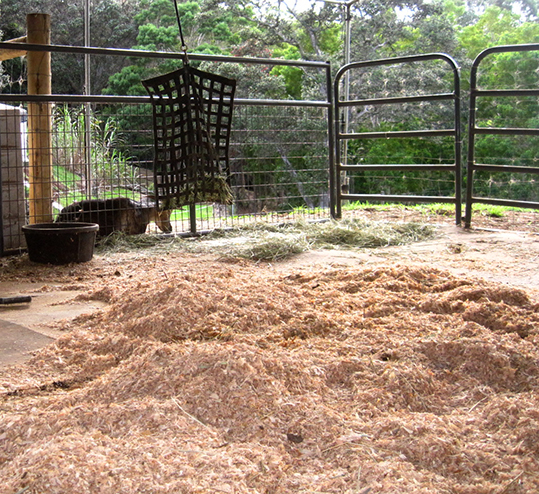 Provide a safe intensive care area with hay and water 24/7, shade and soft bedding. Veterinary Support: If your horse is running a fever and has lost his appetite, it’s time to call your vet with symptoms & vitals in hand. SMZ (Sulfamethoxazole) - sulfa-based antibiotic attacks infection, reduces body temperature and helps prevent further destruction of the laminae. Prevention: By domesticating feral horses, we have made them very delicate. We’ve been led to believe the propaganda of horse food manufacturers and feed our horses grains and sugars, setting them up for disaster triggers. The key is to feed every equine like they’re diabetic, schedule frequent hoof care, manage the environment and give the horse exercise. This information is intended only for the clients of Hawaii Natural Hoofcare and is validated by the definitive study, Clinical Outcome of 14 Obese, Laminitic Horses Managed With The Same Rehabilitation Protocol published by the Journal of Equine Veterinary Science, February 2014.